Our Work - No Yolks Engineering a whole new recipe. Marketing communications engineering comes in all shapes and sizes. When No Yolks engaged us, sales volume, unlike the curvy noodle itself, was decidedly flat. But before we could offer a solution, we had to truly understand the problem. We applied consumer research methodically to uncover a most critical piece of the puzzle. 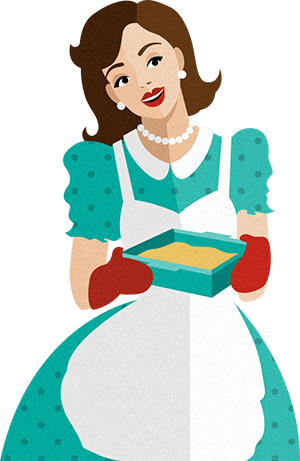 No Yolks continued to be a favorite among moms and home chefs, but usage and consumption were slow due to the nature of the “occasional” recipes, such as goulashes, stroganoffs, and casseroles, that were most closely associated with the noodle. Consumers already loved the product, now they had to be taught how No Yolks already fit their jam-packed lifestyles with some new perspective. We set out to change way more than brand preference—we had to actually deprogram habitual behavior. And then we had to bring the awesome. 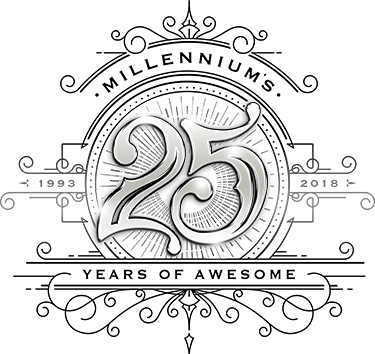 Confident in our insight and strategy, Millennium launched a digital campaign that challenged how consumers think about No Yolks. The disruptive engagement looked, sounded and felt unexpected, and the concept landed square in our target market’s sweet spot. 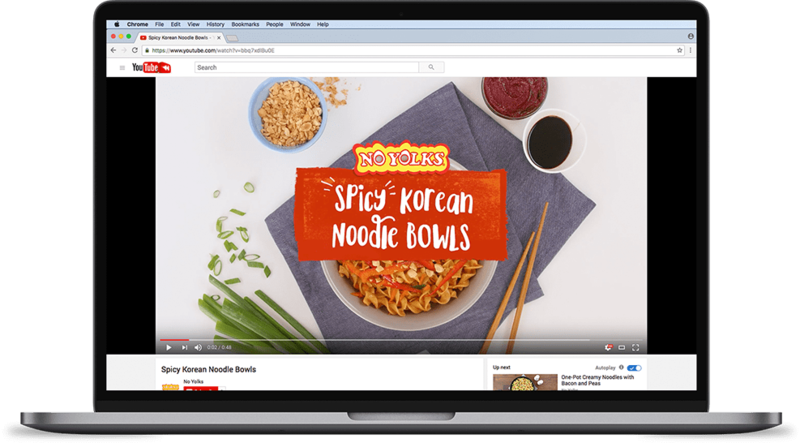 The campaign was built around instantly accessible recipe videos—15 of them. New, fresh, and most importantly, quick and simple ideas that mom could whip up with one spatula tied behind her back. The Asian fusion, one-pot-wonders, gooey mac-n-cheese and other updated “not-your-momma’s” recipes were a hit. We delivered a VTR 33% above industry norms, and overshot our CPV goals by a gaudy 50%. We went where we knew our customer was, launching a Facebook, Instagram, and Pinterest-heavy media plan. Facebook delivered almost 22MM video views and a 38 point lift in ad recall with 25–34s. 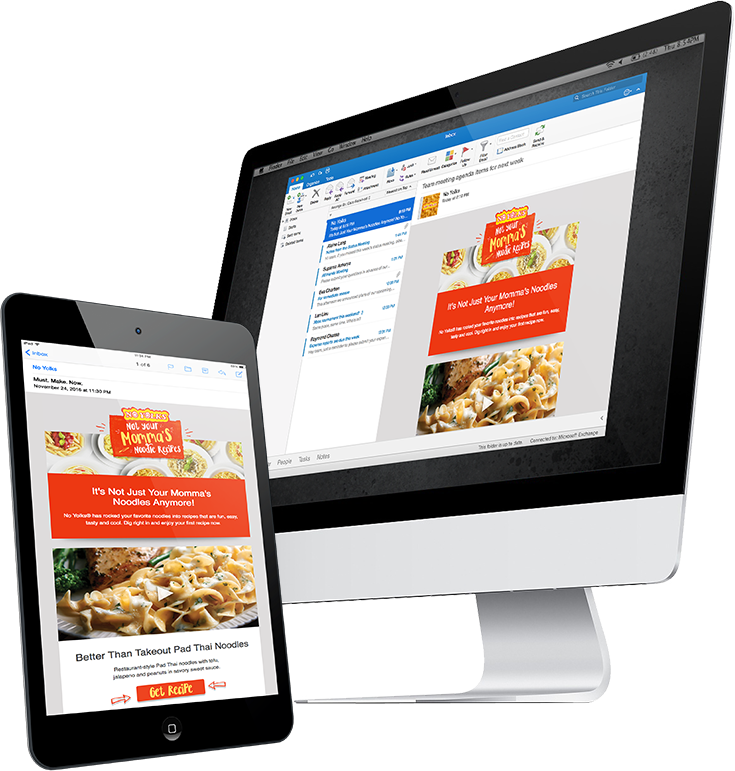 We created responsive web and mobile experiences, maintaining consistent look and feel. 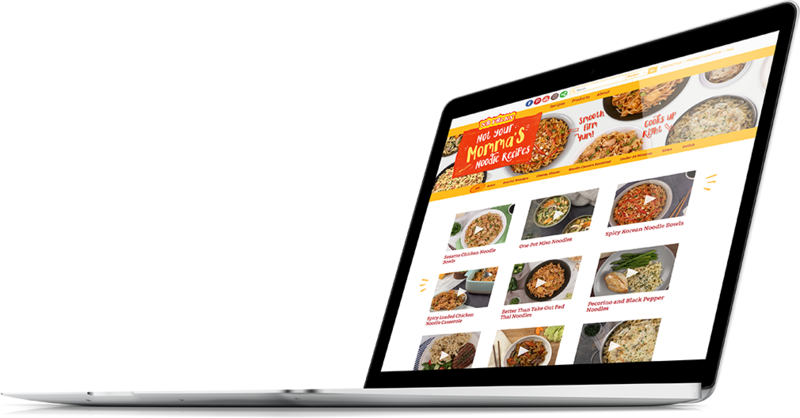 We engaged and created a dialogue with consumers as they interacted with the microsite, offering opt-in correspondence for the sharing of additional recipe ideas in their inboxes resulting in open rates of 20% and a click-thru rate of 40%. In the end, this integrated digital campaign deliciously incorporated desktop and mobile web experiences, email marketing, and social media executions across Facebook, Instagram, and Pinterest. Our unexpected recipe content fueled unprecedented consumer enthusiasm and a new level of engagement with the No Yolks brand.